deliver the wildland fire safety message to members of the community. The program is a three-step process created to teach homeowners how to develop their own action plan of preparedness, have situational awareness, and leave early in the event of a fire. Increasing the safety of residents and firefighters is the main goal of this program. Ready – Take personal responsibility and prepare long before the threat of a wildland fire so your home is ready in case of a fire. Create defensible space by clearing brush away from your home. Use fire-resistant landscaping and harden your home with fire-safe construction measures. Assemble emergency supplies and belongings in a safe spot. Plan escapes routes. Make sure all those residing within the home know the plan of action. Set – Act immediately. Pack your vehicle with your emergency items. Stay aware of the latest news and information on the fire from local media and your local fire department. Go – Leave early! Follow your personal action plan. Doing so will not only support your safety, but will allow firefighters to best maneuver resources to combat the fire. WASHINGTON, DC / June 6, 2012 –In the midst of wildfire season throughout much of the country, theU.S. 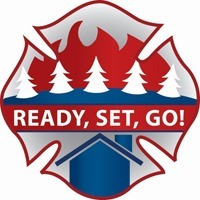 Forest Service, the National Fire Protection Association (NFPA) and the Ad Council announce the launch of a new public service advertising (PSAs) campaign, Fire Adapted Communities, which aims to help individuals prepare their homes and communities for the threat of wildfire. Created pro bono by advertising agency Draftfcb, this campaign addresses the issue of proactively mitigating wildfire damage in fire-prone communities. Nearly 70,000 communities nationwide are at risk from wildfire, according to the National Association of State Foresters. Embers from a wildfire travel great distances, often causing new wildfires more than a mile from their origin. It can take years for communities and local ecosystems to recover from a wildfire. In addition, wildfires cost government, businesses, and individuals billions of dollars each year in suppression costs and damage to homes, infrastructure, the economy, and resources. Wildfire is an inevitable fact of life. This campaign raises awareness that those living in fire-prone communities must prepare in advance to mitigate wildfire damage when it occurs. The more proactive actions a community takes, the more fire adapted it becomes. “Wildfire threat is a reality to thousands of communities across the United States. We are proud to play an active role in Fire Adapted Communities as we continue our efforts to provide tools and information to encourage the public to prepare for wildfire and reduce their risk," said NFPA President Jim Shannon. The television, radio, print, outdoor and web PSAs aim to empower residents to proactively take the steps to make their communities fire adapted by reinforcing that “you can’t control where a wildfire ember will land – but you can control what happens when it does.” The ads direct audiences to visit a new comprehensive website,www.FireAdapted.org, where they can find a host of resources on how to prepare for wildfires. The new web portal is a one-stop shop for the latest developments in wildfire safety, best practices, toolkits, and programs of the nation’s leading wildfire organizations. For more than 68 years, the Ad Council has worked with the U.S. Forest Service and Draftfcb to address the issue of wildfire prevention with the iconic character Smokey Bear and his famous tagline “Only You Can Prevent Wildfires.” The Ad Council partnered again with the U.S. Forest Service in 2009 to create its Discover the Forest campaign encouraging families to unplug and reconnect by getting outdoors and enjoying the wonders of nature. TheFire Adapted Communities PSAs will be distributed to media outlets nationwide this week. Per the Ad Council model, the PSAs will air and run in advertising time and space that is donated by the media. The U.S.Forest Service (www.fs.fed.us)manages 193 million acres of national forests and grasslands for the American public. Its mission is to sustain the health, diversity, and productivity of the Nation’s forests and grasslands to meet the needs of present and future generations. The U.S.Forest Service is the agency responsible for overseeing the use of Smokey Bear in cooperation with the National Association of State Foresters and The Advertising Council. The Wildfire Prevention campaign, featuring Smokey Bear, is the longest-running PSA campaign in U.S. history. NFPA is a worldwide leader in fire, electrical, building, and life safety. The mission of the international nonprofit organization founded in 1896 is to reduce the worldwide burden of fire and other hazards on the quality of life by providing and advocating consensus codes and standards, research, training, and education. Visit NFPA’s website atwww.nfpa.org for more information. The Ad Council (www.adcouncil.org) is a private, non-profit organization that marshals volunteer talent from the advertising and communications industries, the facilities of the media, and the resources of the business and non-profit communities to deliver critical messages to the American public. The Ad Council has produced, distributed and promoted thousands of public service campaigns on behalf of non-profit organizations and government agencies in issue areas of health & safety, community and education. With an equal focus on creativity and accountability, Draftfcb is the first global, fully integrated marketing communications agency for the digital age to operate against a single P&L without any silos. The agency is driven by a singular focus on consumer behavior, recognizing the importance of producing brilliant creative ideas that really matter to consumers in the brief amount of time they are willing to give marketers in today’s media-saturated world. The Draftfcb network spans 153 offices in 90 countries and employs approximately 9,300 people.